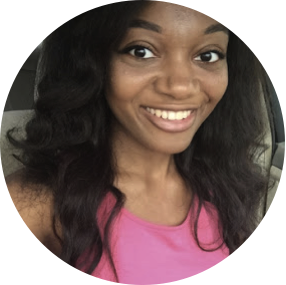 Read Ashley's review of Book Club. Diane (Diane Keaton) is recently widowed after 40 years of marriage. Vivian (Jane Fonda) enjoys her men with no strings attached. Sharon (Candice Bergen) is still working through a decades-old divorce. Carol’s (Mary Steenburgen) marriage is in a slump after 35 years. 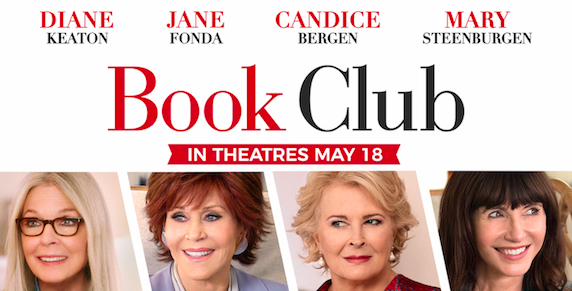 BOOK CLUB is in theaters on May 18th, 2018. 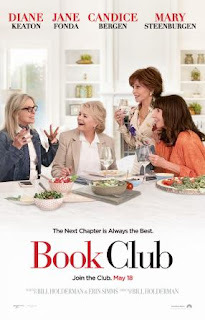 Book Club stars Diane Keaton, Jane Fonda, Candice Bergen and Mary Steenburgen’s book club that has continued to present day from the 1970s. They look for a way to spice up their reading life and choose to read Fifty Shades of Grey and it awakens something in each of them in differing ways. I was not sure what to expect from this movie going into it because I feel like the Fifty Shades trilogy is a bit played out on reading and being “shocked”. I must say this movie did not disappoint because they focused on the Fifty Shades trilogy maybe a total of 5 minutes out of the entire duration. They use the adventurous lives of Christian Grey and Anastasia Steele to create their own adventures and explore the idea of living life at its finest. The storyline was fresh and hilarious as the women were from all different backgrounds yet fit together to form friendship goals. The jokes did not disappoint and it felt like the atmosphere of when you get around your good friends and sharing unlimited laughs. Some of the scenes did not flow well to me and it was that tough transition of going from wow this movie is super funny to this just got a little too serious and intense. It was not bad, just a little choppy and not a smooth changeover. It was a really cute movie overall and a good reminder that the adventure of life does not have to stop despite your situation or surroundings. With great friends anything is possible and having their support makes life one nonstop adventure.